G is for Gemini, also known as the Outer Leg Hang. 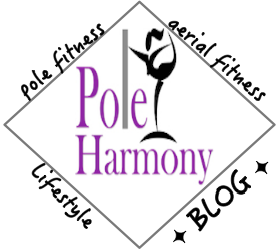 A staple move for those first learning to invert on the pole. Aerial Amy (fellow pole community member blogger) recently posted on Facebook a post about the importance of the inner and outer leg hang duo as foundational moves for pole fitness. I have always hammered into my students that the leg hangs are your go to safety moves. If a move fails, you can lower or catch yourself into either leg hang. I will often end new tricks in leg hangs for a controlled dismount off the pole. It's so important that you develop a strong leg hang on both inner and outer so it becomes a natural part of your muscle memory. 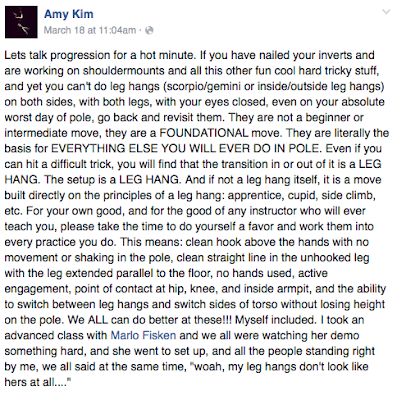 The above status by Aerial Amy gives some great areas for pole dancers to start working on strengthening this move. But what kind of conditioning exercises can be done close to or on the ground that will work on muscle groups specifically for leg hangs? I put together a short routine that safely works on increasing the knee pit grip strength necessary for strong leg hangs. For advanced training, you can also wear stilettos or ankle weights when performing these conditioning exercises. Modification Intermediate: Bridge hips then hook leg for leg hang series exercises, be sure to keep hands at hips for support. Advanced variation: release hands to rest on floor along side hips or overhead. Exercise Challenge: If you're really wanting to challenge yourself and to go along with the AlphaPole theme, instead of drawing inside and outside circles during the leg hang exercises, you can draw the letters of the alphabet with your free leg's toe.